Back to the hospital again for another scan and diabetes clinic... I love the scan part though! My mum came with me this time. 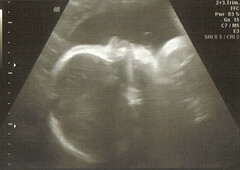 We had a lovely lady do the scan for us. We were in there for a good half hour. Squiggle was facing my spine and refused to turn round and face us, so I was tipped back until I was almost upside down and jiggled ever so slightly until baby finally woke up and turned to face us, giving us a big yawn and a kick. We go to see the little nose and lips! There is deffinatly an Oakes chin there (from me and my dad) but the rest is pure Walker! We got a lovely pic, and the lady wouldn't take any money from me for it! She's clearly been charmed by my beautiful baby! Next it was the dreaded GD Clinic. It didn't kick off too well when the GD Midwife got my name wrong (yes, the same one who said Squiggle was massive, and that the placenta was round the front. Her) but we laughed it off and got on with the clinic. I saw a different midwife first (thankfully one who knows who I am), and she was fine. She checked my blood pressure (normal) and pee (normal, aside from showing me to be hungry, which I was). She looked at Squiggle's growth and said it looked normal. Then I saw one of the diabetes staff who looked over my BGLs and said they were normal and she was happy. Finally I was seen by the guy who looks at diet and such, and he was perfectly happy too. Although he accidentally walked off with the bulk of my notes. I have my Orange notes, and the front & back cover of my Green notes... but nothing in between! I'll stop in tomorrow to pick them up. I'm booked in again for 4 weeks time, another scan & clinic. By then I'll be 37 weeks and they'll decide if I can continue normally or if my consultant (spit!) will interfere like she wants to. In the meantime I'll be seeing my nice midwives at the GPs in 2 weeks.